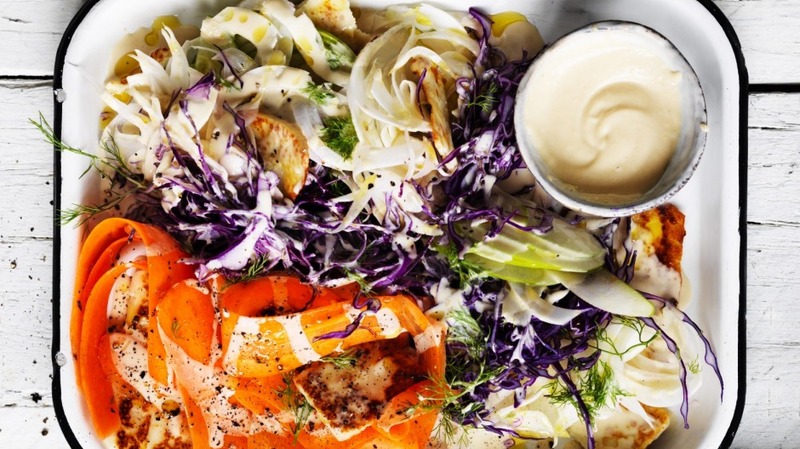 With its umami-packed miso-tahini dressing (which also works well as a dip if you reduce the amount of water added), this colourful slaw is the perfect mix of crunchy, sweet and savoury. Pack it into a lunchbox and take it to work, or serve it as a colourful side dish at your next barbecue. 1. Using a mandolin or a sharp knife, very finely slice the red cabbage, carrots, green apple and fennel head into a large salad bowl. 2. In a separate bowl, make the dressing by mixing together the tahini, miso paste and lemon juice. Add the water bit by bit to the desired consistency. Pour the dressing over the salad and toss to coat. 3. Heat a griddle pan over a high heat. Place the haloumi in a small dish and toss to coat in the olive oil. Add to the griddle pan and cook for 2-3 minutes on each side or until charred. 4. Serve the slaw with the hot haloumi and a scattering of the reserved fennel fronds on top. For more seasonal salads, try Adam Liaw's winter Caesar or Rachel Khoo's pancetta, artichoke and green bean salad.